Although sounding totally indulgent for breakfast, asparagus is rich in folic acid, vitamin C and beta carotene while tomatoes are rich in anti-oxidants, making this a wholesome meal in the morning. Pre-heat the grill. Place the asparagus in a saucepan of simmering water; cook until crisp-tender for 3 to 4 minutes. Drain well. Place sliced bread on baking sheet. Grill 10 cm from heat until toasted, about 1 minute each side. Spread 1 tsp mustard on each slice. Place 2 slices of ham, 6 thin or 3 thick asparagus spears, half a sliced hard-boiled egg, 2 tomato slices and a quarter of the provolone on top. 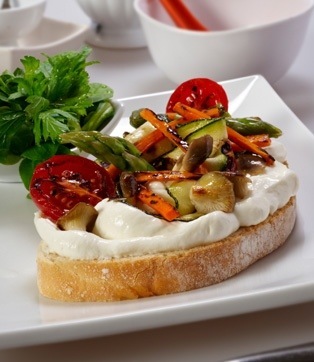 Grill open sandwiches until heated through and cheese is melted and golden brown, 1 to 2 minutes. BEST SERVED WITH HOT COCOA .. nyuummyy.